Blurb: Maddy is allergic to the world. She hasn't left her house in seventeen years. Olly is the boy next door. He's determined to find a way to reach her. Maddy is a teenage girl who has a form of Severe Combined Immunodeficiency aka bubble baby disease. Basically she cannot leave her house or she could die. Maddy lives with her mother. Then they get new neighbours and Maddy is intrigued by the son, who is her age called Olly. They then start a friendship online, that develops and Olly wants to see more of Maddy and Maddy wants to see more than just her bubble world. 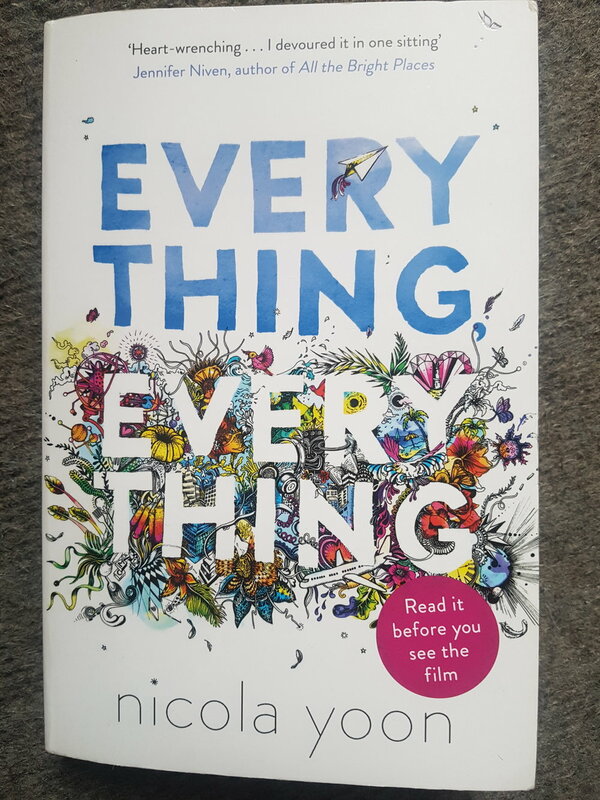 I have heard great things about this book and at first I thought it would be like other books with a main character that is ill and then falls in love but it wasn't. I loved how creative it was, with drawings and notes in Maddy's writing. The book took a very unexpected turn and the way it's revealed was so clever. Yoon captures this love story between these two teens perfectly. I think it was such a unique twist on a 'doomed' relationship. You really do care for both Maddy and Olly as they face their own personal battles and you are rooting for them to make it work.